We still miss you Arizona Sting Lacrosse! Maybe someday the Coyotes will bring back the Sting, at least we can hope! What is the oldest North American sport? 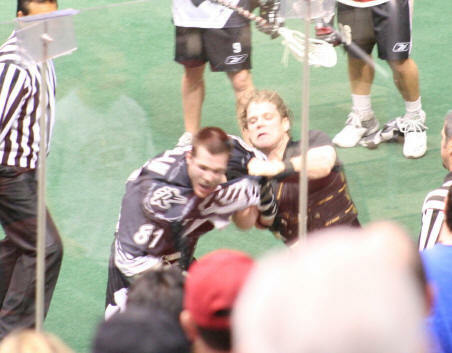 The oldest North American sport that is played professionally today is Lacrosse. Developed by native Americans as early as the 15th century it was played with as few as 100 and as many as over a thousand players and a game would last for 2 or 3 days!. If you said soccer you might want to seek some professional help! Did you not notice that this is a Lacrosse website? Lacrosse is America's fastest growing sport. It is often called the fastest sport on two legs but I prefer to think of it as hockey with traction. What is the national sport of Canada? What is the fastest growing professional sport in Arizona? OK who is the wise guy that said it was football, just because there were two people in the stands at the last Cardinal's home game does not mean the sport has doubled in popularity! What sport did Glen "Pop" Warner substitute for baseball at the Carlisle PA Indian school? Now you have got it, Lacrosse was substituted for baseball because "Lacrosse is a developer of health and strength. It is a game that spectators rave over once the understand it," he said. He undoubtedly had an ulterior motive. Lacrosse, a contact sport, would better prepare his grid warriors for the fall football season. What is the most exciting game and best value for your sports dollar? Who was the first professional sports franchise to raise a banner at the Glendale arena? you will love the Arizona Sting! If you don't know anything about lacrosse but like a action packed hard hitting sports you would have loved the Arizona Sting!